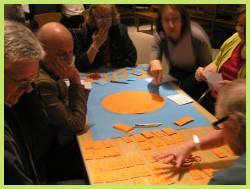 After several months of planning, discussion and debate, Bloomsbury Village stakeholders met on the 5th December for a Planning for Real type exercise at St George's church in Bloomsbury. The event was well attended with around 35 local stakeholders participating in the exercise. Similar to the first event we facilitated back in July and drawing on the work that has taken place since, this event aimed to empower the local community to put forward and prioritise 'real' ideas on how to improve and develop the Bloomsbury Village area. A large-scale plan of the Bloomsbury Village area was divided into sections and each section placed on a trestle table so participants could 'walk around' the model village. The large-scale plan helped people to identify where they live, shop, visit or work and identify specific areas to safeguard or improve. People were then asked to place suggestion cards on the relevant part of the map where it was applicable. 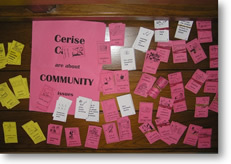 Suggestion cards covered topics such as safety (e.g. improve street lighting), environment (e.g. keep this tree/plant more shrubbery), health (e.g. more GP services), leisure, traffic, future planning etc. Our expert community planner, Michael Parkes was on- hand to guide people through the exercise and we set-up a work-station to help answer any questions about the planning and development context of the plan. By the end of the session, participants had placed suggestions and ideas for improvement all over the Bloomsbury Village map! 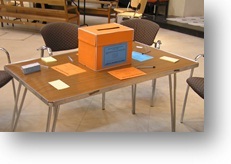 Post-it notes were also available for people to write down any ideas that were not covered by suggestion cards. Certain areas really stood out as areas which could be significantly improved, where as other places, for example Bloomsbury Square, were identified as being of benefit to the community and helped to identify a specific area/tree/property etc which could be protected as part of a neighbourhood plan. Placecheck and outreach surveys were on display for people to fill-in on the day or take home, complete and return. Bloomsbury Village Neighbourhood group have been working with StickyWorld, an interactive web-platform, to create an online viewing and discussion platform for the Bloomsbury Village Neighbourhood Plan. The website was launched at this event and projected onto a big screen so that stakeholders could see how it is possible to participate in the project and planning process for Bloomsbury Village interactively as well as through other communication methods e.g. meetings, working groups and mailing lists etc. The event also provided an opportunity to launch the Bloomsbury Village website, a website set-up by local stakeholders and dedicated to the promotion and continued planning and development of the Bloomsbury Village plan. 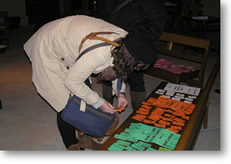 All data from the event was then collected, transcribed and added to the StickyWorld website. The inaugural meeting of the Planning and Development Working Group took place on the 10th November at the Helen Graham House, Gt Russell St from 6pm�8pm. 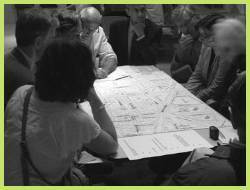 The second Bloomsbury Village planning event took place at the Kingsley Hotel, Bloomsbury. 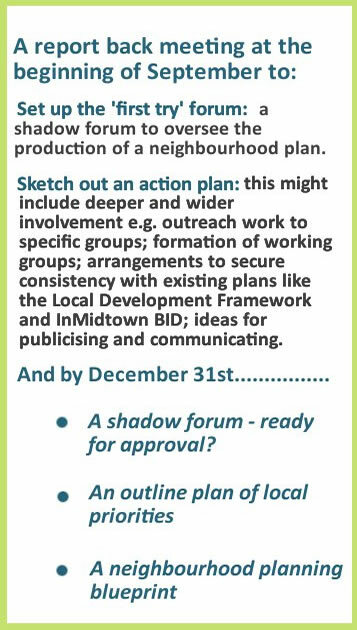 The purpose of the meeting was to feedback the findings of the event in July to those present and agree, in principle, a shadow neighbourhood forum to guide any future planning process. Attendees were asked to establish working groups around specific areas of interest (e.g. forum governance and management; planning and development; Museum Street streetscape) and nominate themselves or others to these groups. 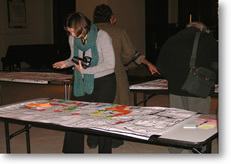 The first Bloomsbury Village planning event took place at St Georges Church, Bloomsbury. The aim of the event was to debate and define �the neighbourhood boundaries', agree the type of forum that could lead the planning process, and start to build a bank of local skills and resources. Approximately 40 people attended the event. This included local residents, some small business owners, representation from InMidtown BID/Terry Farrell Architects, involvement from Camden planning officers, and an observer from the Princes Foundation. A brief event outline and our conclusions and recommendations can be found on this page. 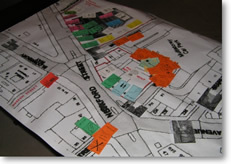 In the first workshop we wanted to find out how local people define the area in which they live i.e. their 'neighbourhood'. We wanted to know which areas and streets they would include or exclude, and their reasoning behind the decision to mark the boundary where they did. In the second workshop we facilitated discussion around picking a neighbourhood forum to guide the planning process. We wanted to know from attendees who they thought should be included on the forum or as advisors, and why they decided to pick these people. We also asked attendees to fill-out a postcard identifying their skills and resources which could be utilized during the planning process. 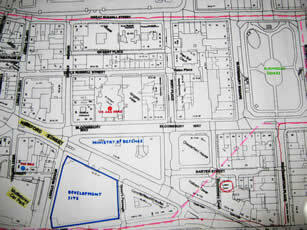 The Bloomsbury Association had provided a map with a suggested boundary as a starting point for discussion. Sections of the boundary were presented as questions for the exercise. Participants in this activity were asked to choose 21 cards representing neighbourhood stakeholders and another 6 cards to represent advisers and co-optees the forum and planning process might need. Blank cards were available for people to include additional or different stakeholders and advisers. People were asked to fill in postcards with offers of things they can do to help (e.g. spreading the word, having good ideas, providing meeting space or catering etc) and deposit them in the bank. With option for phased planning with residential village as phase 1. 11 residents; 1 local councillor (can rotate); 2 small business; 1 InMidtown BID; 1 major landowner; 1 community safety; 1 British Museum; 1 Bloomsbury Association; 1 friends of Bloomsbury Square; 1 Covent Garden Community Association; 1 St Georges Church. The lessons learned from this exercise are listed below. Further details are listed in the full report which is available for download. The idea of neighbourhood planning was new for some attendees and they did not find the introduction explanatory enough. The Bloomsbury Village Neighbourhood Plan will need to fit in with a number of approved planning and development policies set out in the Camden Local Development Framework November 2010. These policies and more, can be inspected online at: http://camden.gov.uk/ldf. You can also download a table summarising the LDF Core Strategy policies and Development Policies (DP). Background information about the Local Development Framework, Site Allocation and Placeshaping can be found on our 'Neighbourhood Planning' page. 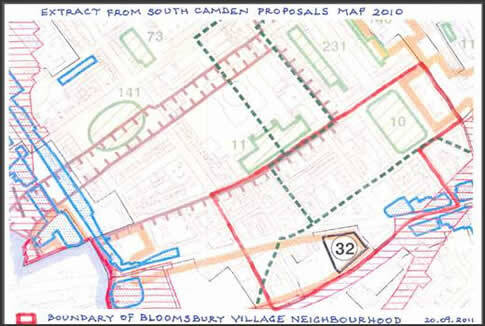 The following picture is an extract from the South Camden Proposals map 2010 which has been edited to include the boundary of the Bloomsbury Village Neighbourhood. Sitting either in or near the Bloomsbury Village boundaries are the proposed development sites in Tottenham Court Road and Holborn. These Growth Areas are based on the Opportunity Areas designated in the Mayor's London Plan, but the boundaries have been set by the LDF Proposals Map. The LDF indicates that these areas are suitable for large scale redevelopment or significant increases in jobs and homes, and are based around transport interchanges where increased capacity is planned. The Growth Areas will take advantage of the new transport capacity created by Crossrail and the Crossrail stations at Tottenham Court Road and Farringdon. Policies for the Growth Areas are set out in Section 1 of the LDF Core Strategy . As you can see on this extract, virtually the whole of the proposed Neighbourhood is covered by the Bloomsbury Conservation Area. There are policies in the LDF to preserve and enhance Conservation Areas. In addition to LDF documents, the Council also produce Place Plans to help guide the development of each area. 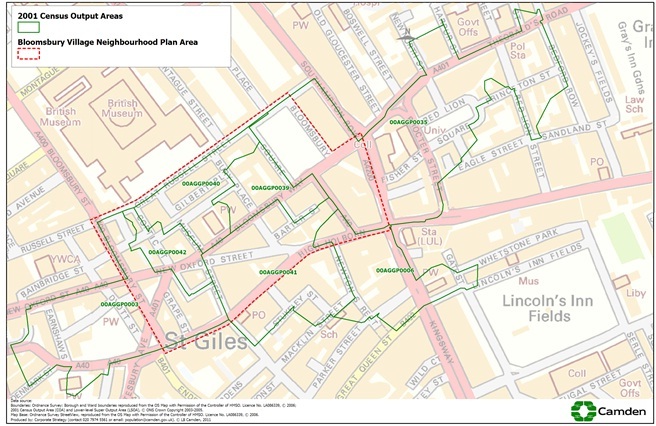 The Council has identified St Giles Holborn as one of nine placeshaping areas which will have their own Place Plans. Placeshaping:- Shaping the future of the St Giles to Holborn area (Sept 2011) is a draft document produced by the Place Plan and Investment team in Camden's Placeshaping service. The document seeks to engage local and other interests on a number of key issues . Critically, it seeks to identify the range and complexity of local issues and priorities which need to be heard and understood in a vision for the area that reflects the interests of those who live as well as work and visit the area. With strong community organisations active in the area as well as the successful BID, there are good partners to work with on this mission. Under these circumstances the Community Forum in Bloomsbury may consider setting up a Planning and Development Working Group. By clicking on the link below you can view the population statistics from the 2001 Census for the Bloomsbury Village Neighbourhood Plan area. The statistics are based on the output areas shown in green on the map. Bloomsbury Village Interactive Project online! The Bloomsbury Village Neighbourhood group have been working with StickyWorld, an interactive web-platform, to create an online viewing and discussion platform for the Bloomsbury Village Neighbourhood Plan. Users can view a map of the proposed boundary, zoom in to view at street level and add sticky notes to make a comment or ask questions about the plan. Its really simple to use so go ahead and take a look!